Contemporary French artist Jean-Pierre Cassigneul was born on July 13, 1935 in Paris. Already at the age of 17 he held his first private exhibition at the Galerie Lucy Krogh in Paris. Two years later Cassigneul entered the Academie Charpentier and then decided to study under Jean Souverbie, a professor at the Ecole des Beaux-Arts de Paris. He passed his entrance examination a year later and enrolled at the L'Ecole Nationale Superieure des Beaux-Arts de Paris. 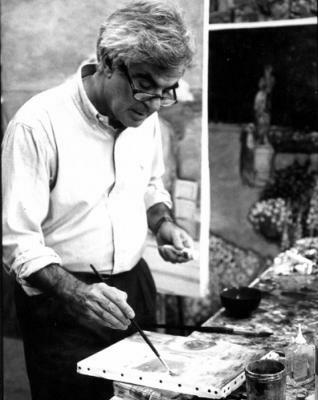 In 1958, Cassigneul had his first exhibition at the Galerie des Beaux-Arts and a year later he was appointed a member of the Salon d'Automne. From 1956 until 1960 Cassigneul was instructed by the French painter Roger Chapelain-Midy. During this period, he held exhibitions in Paris and other cities. He had a contract with the Gallery Bellechasse in Paris for several years after his first exhibition there in 1965. Since then, his work has been exhibited extensively throughout Europe, Japan, and the United States, including shows at the Gallery Tivey Faucon in Paris, Gallery Tamenaga in Japan, and Wally Findlay Gallery in New York. Cassigneul has also illustrated several books, including Le Tour de Malheur by Joseph Kessel. Cassigneul creates beautiful, striking compositions of young women reminiscent of Les Nabis, the early 20th century French Post-Impressionist avant-garde painters, like Pierre Bonnard and Edouard Vuillard. His work also reminds us of that of the expressionist painter Kees van Dongen, especially Cassigneuls' dramatic portraits and his use of intense and vibrant colour.